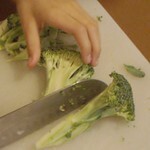 I was surprised that there is not a single tutorial on the internet for cutting broccoli into spears - you know, the long-stemmed, hearty lengths of broccoli you tend to get at a restaurant, rather than the slightly wasteful "florets." I had to figure it all out by my self! 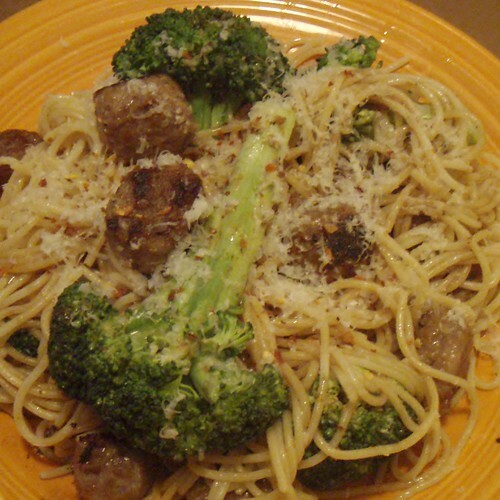 After our broccoli is done, I'll show you a quick pasta dish you can make with it...and tell you what NOT to do when managing several things on the stove at the same time. 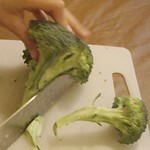 So, chunking a head of broccoli into spears: it goes without saying that you want to start with a nice, long-stemmed head of broccoli. 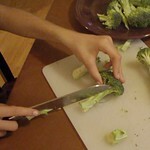 Cut off the dried-up bit at the end, and then start slicing off the outer stems by following the line of the stem through where it connects to the base. Continue until you have reached the tight center of your head, and just cut that the long way into quarters - see? Simple. 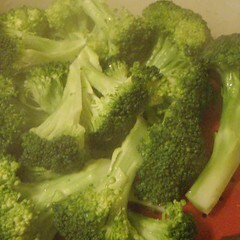 We put about 1/2" of water into our dutch oven, and put in our steamer basket (any type of rack that is food-safe, fits in your pot, and keeps the food above the water line will do) We brought the water to a boil and carefully layered the broccoli over the top. 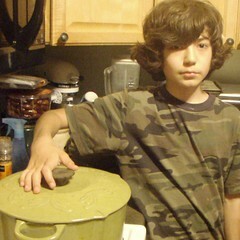 Sparky covered the pot tightly and we set the timer for 5 minutes. 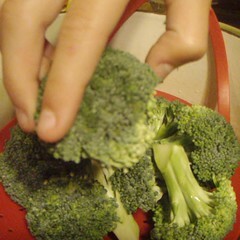 When the timer rang, we checked to make sure our broccoli was tender but vibrant green, and we pulled it out of the steam and set it aside. You can stop and eat now, if you'd like. Sparky cut two Italian-style sausages into rounds (this is easier if they're slightly frozen) and minced three garlic cloves. The sausage was cooked in a cast-iron skillet coated with olive oil, and after it had colored nicely and cooked through, we added the garlic and more olive oil. Learning from earlier mistakes (see below,) we turned off the heat, allowed everything to cool slightly, and then added a ladleful of pasta water to create a sauce. 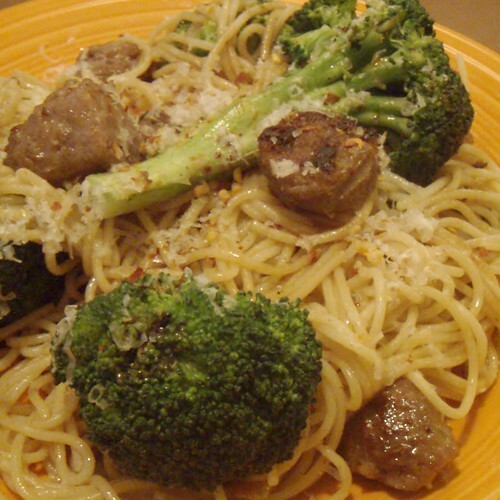 The pasta, broccoli, and garlic oil were tossed together and topped with red pepper flakes and grated Parmesan cheese. Enjoy! While heating the water for the broccoli, I had been cooking some pasta on a different burner, and, in addition, I decided to heat oil to for the sausage and garlic Aglio e Olio (Oil and Garlic.) I stupidly put the pan of oil on a burner directly in front of the water I was boiling for pasta. The result: A gigantic plume of flame leapt out of my pan and up the front of the microwave vent-hood. Had I been thinking, I'd have a pan lid to cover the oil and smother the fire, but instead I screamed for our handy-dandy resident firefighter. By the time he got to the kitchen, the flare-up had put itself out without damaging anything. I had had the presence of mind to leap backwards and avoid the splash, and even more fortunately Sparky was across the room chopping broccoli. Flare-ups are common; they're possible any time you are working with fuels like fat, oil or alcohol and open flame. They often involve the introduction of water to hot oil, and are most dangerous when they catch other things on fire: kitchen towels, drapes, loose sleeves, hot pads, paper towels, etc. As water evaporates, it quickly expands to 1700 times its original volume. This force aerosolizes the oil, dispersing fine particles in all directions and putting fuel in reach of the burner. You can learn more about the chemistry and physics of fire here. You can typically put out a flare-up by either smothering it with a lid, or tossing baking soda on it - so if you're working with oil on the stove, keep those two things handy. So, the take-away safety message - don't heat oil and water (or wet foods) in close proximity. Don't heat a large amount of oil if you plan to add wet ingredients to it. Keep fire supression tools in arm's reach when you're cooking. Or be lucky enough to marry and have kids with a firefighter, and only cook when he's off-shift.